Turmeric powder is produced from pure turmeric rhizomes and is packed with curcumin, a strong antioxidant with powerful anti-inflammatory properties. Turmeric can support joint health, a strong digestive system and natural healing. 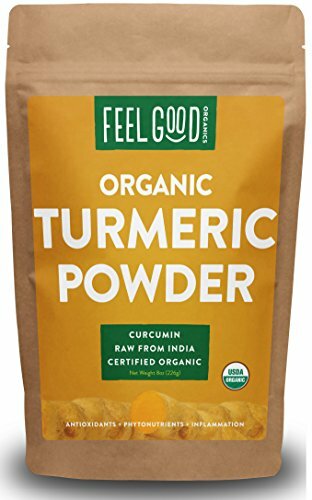 This resealable bag contains 8 ounces of certified organic, 100% raw turmeric powder harvested from turmeric plants in India. Where does the Turmeric Powder come from? India. Our 100% raw, certified organic Turmeric Powder is imported to the USA directly from India. Do you add anything to the Turmeric Powder? No! Our organic Turmeric Powder is 100% raw with no additives. Is your Turmeric Powder Non-GMO? Is your Turmeric Powder Gluten-Free? Yes! Our Turmeric Powder comes packaged in the highest quality kraft bags. The bags are made with a resealable zipper, 5-layer structure with foil lining, rounded corners, and a tear notch for easy opening. How can I use Turmeric Powder at home? Turmeric powder is produced from pure turmeric rhizomes and is packed with curcumin, a strong antioxidant with powerful anti-inflammatory properties. Turmeric can support joint health, a strong digestive system and natural healing. Mix into smoothies, brew a cup of “Golden Milk” and supercharge your favorite recipes.